Since the resurrection of Jesus Christ is the culmination of God’s work of creation, the insights to be drawn from it may very well be infinite in number! But in this short post I offer the following five insights which I hope will be beneficial to you. 1. The women as the first witnesses to Jesus’ resurrection powerfully affirm its authenticity. 2. There were multiple resurrection appearances by Jesus which left the apostles fully convinced that Jesus had risen from the dead. It is a point not to be underestimated that Jesus made multiple resurrection appearances over the course of forty days. Thus, the apostles were not left wondering whether they had seen Jesus in the flesh following his death and burial – Jesus went out of his way on multiple occasions to make sure that they had! Consequently, you have complete uniminty among the remaining eleven apostles that they had seen the risen Christ. By way of contrast, we don’t have a case here where six of the apostles claimed to have seen the resurrected Christ, whereas three denied it, and two were not sure. And these were men that went on to live heroic lives, to suffer and die for what they had witnessed, spawning the amazing rise of the Christian faith despite insurmountable obstacles, and without any resort to violence. 3. Jesus instituted the Sacrament of Confession during one of his resurrection appearances. I don’t know how to say this: forgiveness of sins is the greatest need every person has. Jesus, in His Infinite Wisdom, and in His genius as the leader of souls, has willed that forgiveness of sins be readily available from his priests, where the concrete actions of forgiveness, absolution, and spiritual guidance can take place in a powerful and effective manner appropriately tailored to our human situation, and leading thus to an authentic spiritual resurrection of our souls! 4. Jesus’ wounds are a special manifestation of his resurrection. “By means of touch and the sharing of a meal, the risen Jesus establishes direct contact with his disciples. 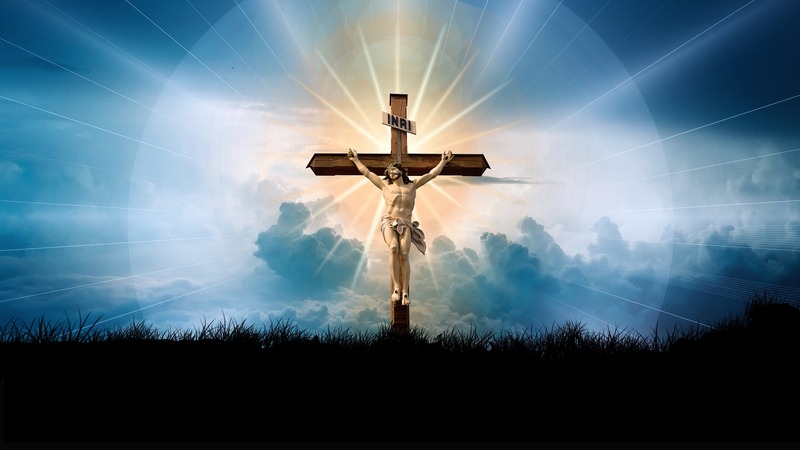 He invites them in this way to recognize that he is not a ghost and above all to verify that the risen body in which he appears to them is the same body that had been tortured and crucified, for it still bears the traces of his Passion. Yet at the same time this authentic, real body possesses the new properties of a glorious body: not limited by space and time but able to be present how and when he wills; for Christ’s humanity can no longer be confined to earth, and belongs henceforth only to the Father’s divine realm” (no. 645). 5. Jesus reestablished Peter as head of the Church during one of his resurrection appearances. Peter had previously stood by a charcoal fire in John 18 when he denied Jesus three times. Now, in the presence of another charcoal fire, and in order to restore and reaffirm Peter as head of his Church, Jesus leads Peter to express love for Jesus three times. Each of these three times Jesus implores Peter to take care of his sheep, and on the third time Jesus alludes to Peter’s manner of death, where Peter will “stretch out [his] hands” on a cross in imitation of Jesus. The historical authenticity of the resurrection of Jesus’ body from the dead is well proven by the Gospel writers, especially by the numerous accounts they provide of Jesus’ resurrection appearances, and the subsequent witness of the apostles shows they were fully convinced that Jesus had risen from the dead. 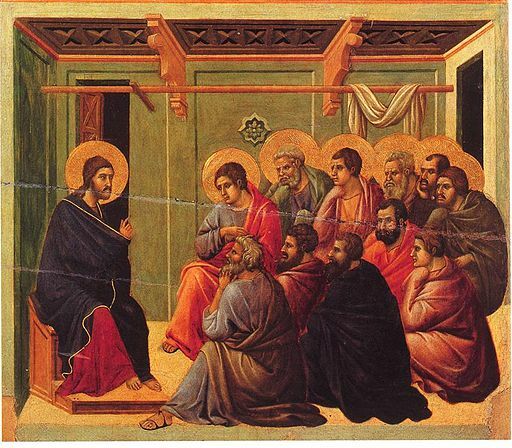 Indeed, almost all of these apostles went on to convincingly confirm that they witnessed the resurrected Jesus with the witness – the Greek word “martyr” literally means witness – of their own lives, which is a most powerful testimony. Moreover, Jesus demonstrates by his resurrection his great concern for the Church – this by establishing the Sacrament of Confession during one appearance, and by reaffirming Peter as head of the Church on another, and by the retention of his sacred and glorious wounds on his resurrected body in order to remind us that by “his wounds you have been healed” (1 Peter 2:24). Jesus Christ, risen from the dead, is the source of all good things for us! Gather in for your eternal welfare the incredible “POWER flowing from his resurrection” (Phil 3:10). The goal of this note is to help you purify your heart of bitterness and resentment. “The true Christian,” says Father Garrigou-Lagrange, “ought as far as possible to exclude from his heart all resentment, all animosity.” Easier said than done! Right from the start see clearly that you cannot take bitterness and resentment with you into Heaven. The saint that God is fashioning you to be does not include a person with a bitter heart. You are going to have to get this mess out of the way! It’s not going to be easy. But you have to do it. This is a good start. An immediate remedy, whenever you feel the movement of bitterness and resentment escalating in your heart, is to severely check it, and then pray, “Create in me a clean heart, Oh Lord, and renew in me a right spirit” (Psalm 51:10). This will work, if your prayer is sincere, and you commit to doing this each and every time you feel bitterness welling up in your heart. This can’t be a two week thing; it’s a lifetime commitment. But you will quickly discover that this little prayer from Psalm 51 is powerful! A long time ago I planted a vine of some sort in the bed in my front yard. The vine was so prolific that it grew seemingly everywhere in no time. I cut it back, but it grew back with a vengeance! The vine was covering up the beautiful flowers in the bed, so I ultimately had to pull the vine up by its roots to save the garden from the tyranny of the vine. Scripture says that bitterness can become an evil vine in your heart and defile you. It says: “See to it that no one fails to obtain the grace of God; that no ‘root of bitterness’ springs up and causes trouble, and by it many become defiled….” (Hebrews 12:15). At Deuteronomy 29:18-19, 23 we read: “Beware lest there be among you a root bearing poisonous and bitter fruit . . . saying, ‘I shall be safe, though I walk in the stubbornness of my heart.’ This will lead to the sweeping away of moist and dry alike . . . nothing growing . . . no plant can sprout . . .” (ESV). And at Ephesians 4:31 we are directed to “Get rid of all bitterness….” But how are we going to do this? We can even see that bitterness has become part of our very personality, part of the description of who we are. Once when I was driving home I heard the “radio preacher” say: “Lord, you have saved me from hell’s dark abyss – now Lord, save me from the tyranny of bitterness!” Prayer is a very good start. We have to bring this problem directly to God. But it has to be persevering prayer. Prayer means that we are willing to be severe with our self when those feelings of bitterness crowd our mind and demand approval. Here are SEVEN STEPS I put forth to assist you in your battle to overcome bitterness and resentment. I do not say they are “seven easy steps,” but rather seven steps requiring diligence and perseverance. I do believe, however, that they will be very helpful to you. FIRST STEP: The keen and acute realization that you need to get the ruin of bitterness and resentment out of your life. “Bitterness is just resentment that has been held on to. It has become rancid and rotten. It is kept in and it gets worse. The links in the chain continue. There is a connection between bitterness and hatred….” (Jim Wilson). And frankly, what is hatred, unless checked, but the raw material of mortal sin. “Psychology Today blogger, Stephen Diamond, Ph.D., defines bitterness as ‘a chronic and pervasive state of smoldering resentment, and deservedly regards it as ‘one of the most destructive and toxic of human emotions.’ I’d add that if we repeatedly ruminate over how we’ve been victimized, our ‘nursing’ our wrongs may eventually come to define some essential part of who we are. Take hold of our very personality. And so we’ll end up becoming victims not so much of anyone else but, principally, of ourselves” (Mike Jones at psychologytoday blog). The great F.W. Faber adds: “Look what an amount of bitterness we have about us! What is to become of it? It plainly cannot be taken onto heaven. Where must it be left behind? Certainly one important feature of heaven will be the absence of all bitterness and criticism, and the way in which our expanded minds will be possessed with thoughts of the most tender and overflowing kindness” (edited from Spiritual Conferences). The physical and psychological consequences, then, of harboring bitterness and resentment are not good. SECOND STEP: Making the healing of bitterness and resentment a special object of your prayers. I must emphasize here persistence in prayer! Persevering prayer goes to the essence of prayer. “Pray without ceasing” (1 Thes. 5:17). You could pray every morning: “Dear Jesus, meek and humble of heart, make my heart like unto yours. Oh Jesus, Savior of the human race, remove all bitterness and resentment from my heart. Let me live in the newness of life given to me in baptism. 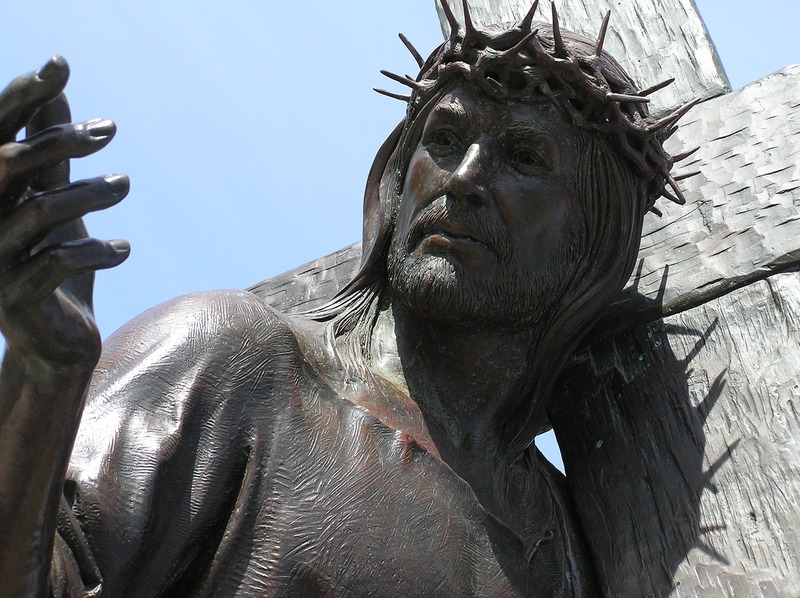 Let me be healed through the power of your wounds.” Naturally, you are free to enter into personal conversation with Jesus about your life and the problems you are trying to overcome, and this intimate conversation with Jesus is very helpful. At the end of each day you are going to make an examination of conscience. This examination of conscience will be very helpful to you. In this examination you will simply review your day in the presence of the Lord noting any instances where you failed to mortify the inclination to entertain bitterness and resentment (refer to the third step on the practice of purity of heart regarding how to do this). Tell the Lord of your sorrow for having entertained bitterness or resentment, and ask him once again for the grace to overcome these vexing inclinations. Of course, if you are making progress, rejoice with the Lord in the good he is accomplishing in your soul. THIRD STEP: The practice of purity of heart. One of the great advocates of the practice of purity of heart was the gifted spiritual writer, Father Louis Lallemant, whose students included Issac Jogues and Jean de Brebeuf, both of whom became canonized saints. Father Lallemant stresses that so much good in the spiritual life is accomplished by the practice of purity of heart. By the practice of purity of heart you become a keen and diligent observer of our own thoughts. By the practice of purity of heart we keep a very careful watch over all the thoughts being presented to our mind and over all the affections and passions being presented to our heart. By this careful watch, we almost immediately intercept and delete the thoughts and affections which violate purity of heart. Thus, as a very simple example, should I suddenly feel the desire to gossip about someone, I check out this movement of my heart, examine it, and ultimately suppress or delete it since it violates purity of heart. Or, as another example, should I suddenly feel swelling up in my heart ill-will towards a certain person, the practice of purity of heart obligates me to take a close look at this movement of my heart, and to mortify it, and to replace it with Christian charity and forgiveness. Gradually, by steadfastly and diligently practicing purity of heart, our heart becomes cleaner and cleaner. What do we want more in our lives than purity of heart? Purity of heart is a mechanism of introspection whereby we carefully look at our thoughts and affections, even moment by moment, to place them under Christ’s law of charity. As soon as we observe that our mind or affections are tending in a sinful direction, we immediately mortify such thoughts or affections, giving them no chance of growth within our souls. Its sort of like we’ve installed security software in our brain that immediately detects and deletes bad stuff (God’s given us the software and all we have to do is learn how to use it!!). Thus, says Father Lallemant, “one of the greatest graces which God bestows upon us in this life…is to be so watchful over our heart as that the least irregular movement shall not secretly arise in it without our perceiving it and immediately correcting it….” We ought to pray to God for the grace to practice purity of heart, which will be so helpful to us in purifying our thoughts, remembering the biblical admonition to “take captive every thought to make it obedient to Christ” (2 Cor. 10:5). FOURTH STEP: The regular use of sacramental confession. “It [sacramental Confession] also performs an authentic ‘spiritual resurrection,’ restores the dignity and the good of the life of the children of God, the most precious of which is friendship with God. If bitterness and resentment have captured your heart, being something akin to a venial sin virus in your moral anatomy, touching upon the possibility of mortal sin, let the power of Sacramental Confession eradicate this illness and set your heart at peace! Remember, this was a sacrament instituted by Jesus Christ (see John 20:21-23). Jesus is there when you go to Confession. “The one and only thing that can prevent these adverse developments is the timely act of one’s will, namely forgiveness. I am convinced that when Jesus taught us to pray the Our Father, He had in mind our psychological well-being as much as our spiritual wholeness. He knew that every one of us would repeatedly be in situations in which he had “every right” to feel anger and resentment as natural reactions to ill treatment by others. Wanting us to be happy even in those circumstances, He gave us – in addition to reason and common sense to be used for the purpose of defense and attainment of justice – the ultimate “tool,” so to speak, to be saved from the consequences of chronic, unresolved anger and resentment. That particular “tool,” of course, is the act of forgiving” (Catholic psychiatrist Conrad W. Baars). SIXTH STEP: Growth in the Gift of Piety. To attain a deepening of this Gift of Piety, Saint Pope John Paul II recommends prayer to Mary, saying: “Let us ask the Holy spirit for a renewed outpouring of this gift, entrusting our prayers to the intercession of Mary, sublime model of fervent prayer and maternal tenderness.” See also Father Lovasik’s small book, Favorite Novenas to the Holy Spirit, as a means to deepen and harness this Gift of Piety. SEVENTH STEP: Regular Eucharistic Adoration. Ref. In addition to the sources listed above, I see that the tone of my note is influenced by F.W. Faber. He’s the one who says that you are going to need “to get this ruin out of the way,” or something close to that. “This is precisely the mystery [of the Incarnation] in which Joseph of Nazareth ‘shared’ like no other human being except Mary, the Mother of the Incarnate Word. He shared in it with her; he was involved in the same salvific event; he was the guardian of the same love, through the power of which the eternal Father ‘destined us to be his sons through Jesus Christ’ (Eph 1:5)” (Saint Pope John Paul II). I am relying heavily on Father Faber’s wonderful insights for the content of this note. If you read his book Bethlehem, I believe you will find most of the points made in this note contained therein, or in another one of his books. Father Faber recommends an immense devotion to Saint Joseph, and in particular he recommends Father Lallemant’s famous Novena to Saint Joseph explained in detail by Father Faber in this note. Consider for a moment, as Father Faber suggests, the infinite blessedness of the child Jesus. Consider, as well, the “colossal sanctity” of the Virgin Mary. Now, contemplate in amazement that Joseph was entrusted by the Eternal Father with the care and custody of Mary and Jesus. How precious Joseph must be to Jesus and Mary! Who can fathom the depth of their love for Joseph? How pleasing it must be to Jesus and Mary when we honor Saint Joseph. Devotion to Saint Joseph is prudent not only in light of the fact that he is the Patron Saint of a happy death (the moment of death is the moment that determines everything – all that we will be for all eternity), but also because Joseph is an image of the tender and loving Eternal Father, and thus devotion to Saint Joseph – as Father Faber points out – smooths out a harsh or even melancholy view of God the Father. What is more crucial in our spiritual lives than to view God as our tender, loving Father? Only then can we truly trust in God and have that confidence in the Father that made the saints saints. Oh how Jesus is praised through his Saints! Next to Mary, Joseph must be the greatest of all the saints. To think that in his earthly life he received the love of Jesus and Mary, day by day, moment by moment, is to realize that he received love beyond anything we can imagine! It is the type of love we will receive in Heaven, when our hearts will be big enough to receive such love. Yet, as it appears, when Mary took Jesus in her womb to see Elizabeth, and John the Baptist leaped in his mother’s womb as if sanctified by the presence of Jesus (Jesus subsequently calling him the greatest of all the prophets! ), how much more was Joseph sanctified by Jesus from the moment of the Incarnation and Mary’s “Yes” until the day he died in the arms of Jesus and Mary. One of the great advocates of devotion to Saint Joseph was the gifted spiritual writer, Father Louis Lallemant, whose students included Issac Jogues and Jean de Brebeuf, who both became canonized saints! Father Faber relates that Father Lallemant “was gifted with an extraordinary grace for inspiring every body with a devotion to St. Joseph ; and his advice to persons who desired to enter on the ways of spiritual perfection was to take as their model of humility Jesus Christ, as their model of purity the Blessed Virgin, and as their model of the interior life St. Joseph. It was after these divine patterns that he labored at his own perfection ; and it was easy to perceive how happily he had wrought them out in his own person. Every day, in honor of St. Joseph, he observed four short exercises, from which he drew wonderful profit. The two first were for the morning, and the two others for after dinner. 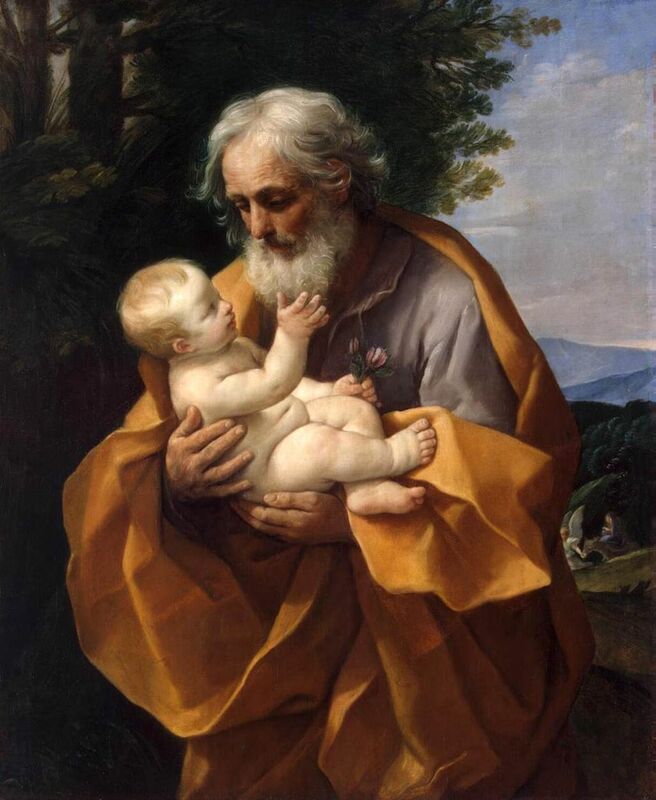 The first was to raise himself in spirit to the heart of St. Joseph, and consider how faithful he was to the inspirations of grace, then turning his eyes inward on his own heart, to discover his own want of fidelity, he made an act of humiliation, and excited himself to perseverance. The second was to reflect how perfectly St. Joseph reconciled the interior life with his external occupations. Then, turning to observe himself and his own occupations, he perceived wherein they fell short of the perfection of his model. By means of this exercise he made such progress, that towards the close of his life he remained in an uninterrupted state of interior recollection and the attention which he paid to external things, instead of weakening his union with God, served rather to strengthen it. The third was to accompany in spirit St. Joseph, as the spouse of the Blessed Virgin, and to meditate on the wonderful knowledge which he had enjoyed of her virginity and maternity, in consequence of the humble submission with which he received the announcement of the Angel respecting the mystery of the Incarnation. By this exercise he excited himself to love St. Joseph for his love of his most holy spouse. 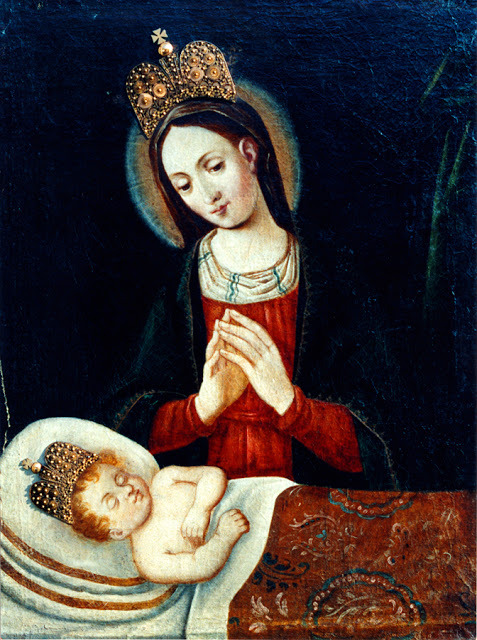 The fourth was, to figure to himself the adoration and homage of love and grati tude which St. Joseph paid to the Holy Child Jesus, and to beg to participate therein, that he might adore and love this Divine Infant with all the sentiments of the deepest reverence and the tenderest love of which he was capable. He wished to carry with him to the grave some tokens of his devotion to this great Saint, and requested that an image of his beloved patron might be put with him in his coffin. It was observed on many occasions that St. Joseph never refused him any thing he asked ; and whenever he wished to induce persons to honor him, he used to assure them that he did not possess a single grace which he had not obtained through his intercession” (from Father Faber’s Introduction to Father Lallemant’s great treatise on the spiritual life, The Spiritual Doctrine). I believe it was in the final apparition of Fatima that Joseph was seen by Sister Lucia, holding the child Jesus, and blessing the world. Dear Jesus, thank you for sharing your virginal Father with us. Is there anything that you will not share with us? For you told us that it is the Father’s good pleasure to give us the Kingdom ( Luke 12:32) and the Kingdom of the Incarnation begins with the Holy Family, and its head, Good Saint Joseph. “To other Saints Our Lord seems to have given power to succor us in some special necessity – but to this glorious Saint, I know by experience, He has given the power to help us in all. Our Lord would have us understand that as He was subject to St. Joseph on earth – for St. Joseph, bearing the title of father and being His guardian, could command Him – so now in Heaven Our Lord grants all his petitions. I have asked others to recommend themselves to St. Joseph, and they, too, know the same thing by experience . . .” (Autobiography). Nothing less than an immense devotion to Saint Joseph is justified. He is the Patron of the Universal Church. He is the Patron of a Happy Death. Don’t you dare lie down to die – when the time comes – without having Saint Joseph close to your heart! Dear friend, your love for Jesus and Mary will most certainly increase the more you draw nearer to Saint Joseph. References: Favorite Prayers to Saint Joseph (TAN), a highly recommended devotional to Saint Joseph which includes Father Lallemant’s famous novena mentioned above. I am certainly indebted to Father Faber for the tone and content of this entire note, but especially the first two paragraphs and the last two paragraphs, which contain not only his insights but his manner of speaking too. For example, he talks about “nothing short of an immense devotion” in one of his books, and “not lying down to die” in another. WHAT REALLY IS THE PURPOSE OF PENANCE? I said to myself the other day, “self, what is on your mind?” Self responded, “I’ve been thinking about how important the rock has been in my life.” “What rock is that,” said self-reflective self? “The rock of Peter,” said self in a sort of self-less way. And then self went on to explain what he meant to his self-reflective and thoughtful companion. 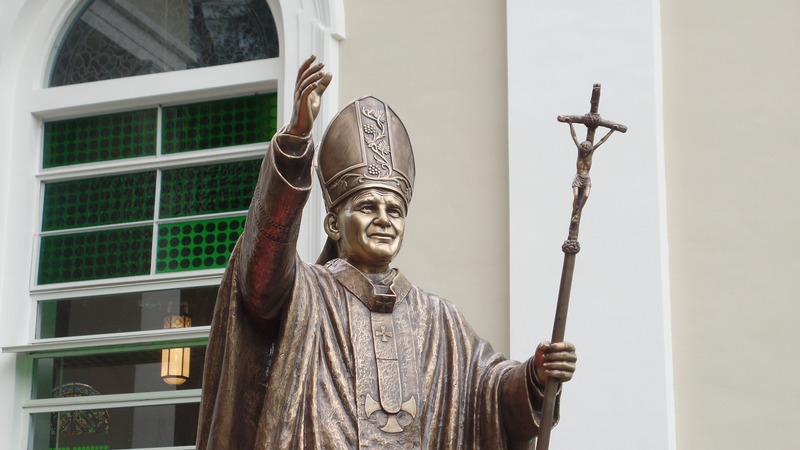 We asked the man who he was, and he said, “I am the Successor of Peter, and Peter was the rock upon whom Jesus built his church.” This man, whom we came to know as John Paul II, explained to us that there is an objective moral order in the world precisely because the world is an image and reflection of God – its Creator. 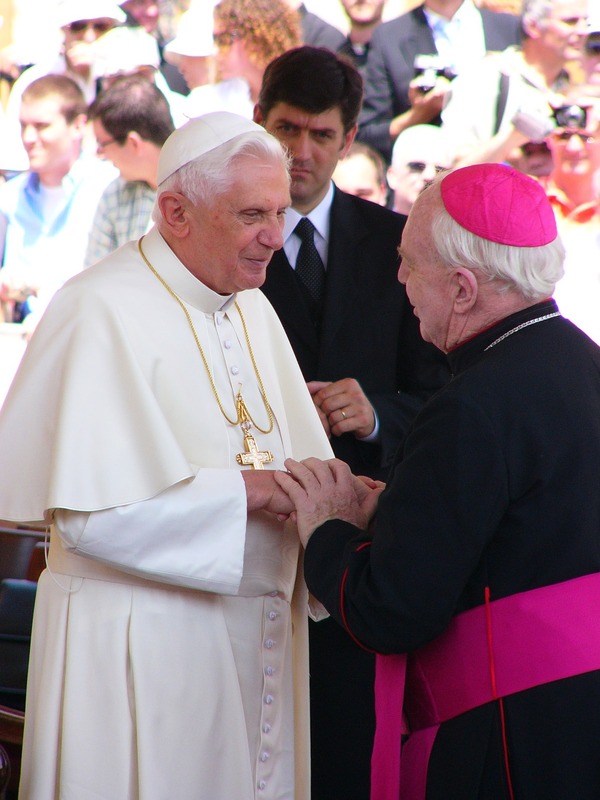 He told us that he had written and promulgated an encyclical, The Splendor of Truth, in which he not only refuted the theory of moral relativism but reaffirmed with the authority of Christ’s Vicar the universality and objectivity of the moral law. “Each of us knows how important is the teaching which represents the central theme of this Encyclical and which is today being restated with the authority of the Successor of Peter. Each of us can see the seriousness of what is involved, not only for individuals but also for the whole of society, with the reaffirmation of the universality and immutability of the moral commandments, particularly those which prohibit always and without exception intrinsically evil acts” (paragraph 115 of Veritatis Splendor). Inspiration: For format: Bunyan’s The Pilgrim’s Progress.